Yamaha APXT2 Review – No Toy Guitar! 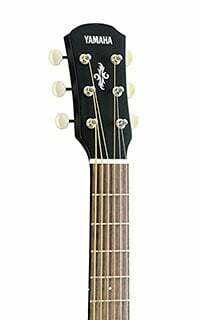 The excellent thinline APX500II is Yamaha’s best-selling electro-acoustic guitar, so it makes sense that they would produce a smaller scaled version for players with smaller hands. 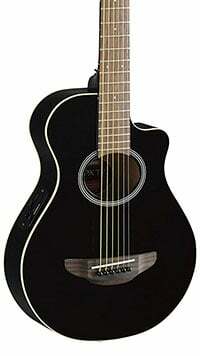 Enter, the APXT2, which more than earns its place in our chart of the best acoustic guitars for small hands. This compact steel-string electro-acoustic retains the stylish looks, slimline feel and quality electronics that made the original so popular, with an equally wallet-friendly price tag. The APXT2 is certainly cut from the same cloth as Yamaha’s APX500II, albeit smaller. It sports a single-cutaway thinline body shape with a 3/4 scale, a top made of spruce (laminated of course – this is a sub-$200 guitar after all), and the familiar oval soundhole. The back and sides are made from meranti, which is a dark wood that’s essentially a more cost-effective mahogany. In addition to the natural model – which nicely shows off the grain of the woods – the APXT2 comes in both glossy black and ‘old violin sunburst’ finishes. The small hand-friendly neck joins the body at the 14th fret, and is crafted from nato, with a fully-accessible rosewood fretboard, 21 frets and dot inlays. Its size is perfect for beginners, children and adults with smaller hands, although every guitarist would find some use from it as a travel guitar – it feels pretty robust, so taking it on the road wouldn’t be out of the question. The APXT2 is an electro-acoustic that’s fitted with an ART-based preamp, with a System 68 contact pickup. The preamp features a control panel that experienced guitarists may find a little basic, although beginners will benefit from its simplicity – just a master volume and tone control knob along with a built-in digital tuner. Electronics aside, the APXT2 features a set of decent vintage-style covered tuners on the headstock, a rosewood bridge, and a plastic nut and saddle. It also comes with a very convenient padded gig bag for easy transportation and storage. For such a small guitar, it actually sounds very good. It’s not comparable to a full-size dreadnought in terms of projection or tone, but the APXT2 provides more than enough volume for practice and home performance, while the bright sound remains natural when amplified thanks to the ART system. Due to the limited controls it’s not the most versatile of systems when compared to some other acoustic preamps, but for travel and practice this is sufficient. The price tag, coupled with things like a plastic nut and laminated woods, suggest that the Yamaha APXT2 is an entry-level guitar – and it is. 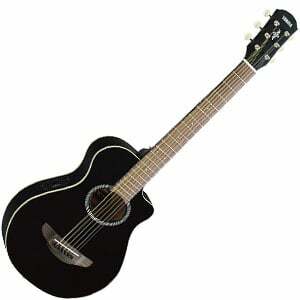 But it offers a lot in the way of playability, style and sound. With a small scale and lovely neck feel, it really is perfect for beginners and those with smaller hands, although ‘full-size’ players would find plenty of use with it as a travel guitar. Overall, pretty great! For more info about the Yamaha APXT2, click here. For more top small-hands guitars, click here. Does this come in a left handed option??? it would also take the full electro-acoustic makeover(including the back-of-head brass plate below the machine heads) with Duncan hotrails at bridge, Fishman NeoD across the soundhole and maybe even a Roland GK3 with internal electrics – will have to wait to sus Kickstarters OMB, but OMB might just be the killer augmentation – just me thinking about the guitars my great- grand daughters might be playing in 20 yrs time! No inlay on the 3rd fret, nor a side marker on the neck for the 3rd fret……yuk….